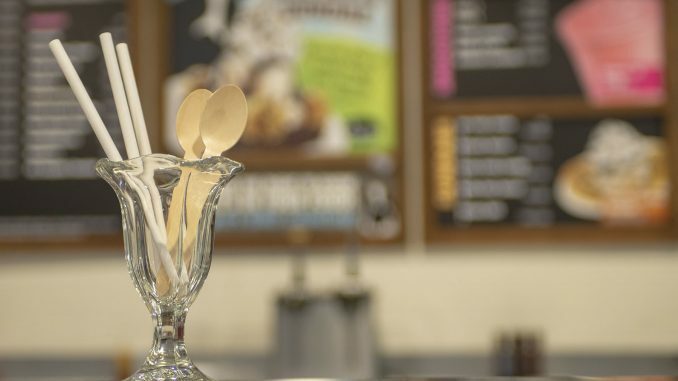 Ben & Jerry's is moving away from single-use plastic. The company says it will stop offering plastic straws and spoons in its more than 600 Scoop Shops worldwide in early 2019. BURLINGTON, Vt. — Ben & Jerry’s is mooooving away from single-use plastic. As a first step, the company will no longer offer plastic straws and spoons in any of its more than 600 Scoop Shops worldwide in early 2019. The company also announced a plan to address plastic cups and lids used to serve ice cream by the end of 2020. By April 9, 2019(Free Cone Day! )—Scoop Shops will complete the transition to wooden spoons. Paper straws will be available by request only. As an aspiring social justice company, Ben & Jerry’s believes in a greater calling than simply making a profit for selling its goods. The company produces a wide variety of super-premium ice cream, yogurt and sorbet using high-quality ingredients. Ben & Jerry’s incorporates its vision of Linked Prosperity into its business practices in a number of ways including a focus on values-led sourcing. In 2015 the company completed its transition to using entirely non-GMO (genetically modified organisms) ingredients by source as well as to fully source Fairtrade-certified ingredients wherever possible, which benefits farmers in developing countries. Ben and Jerry’s products are distributed in 35 countries in supermarkets, grocery stores, convenience stores, franchise Ben & Jerry’s Scoop Shops, restaurants and other venues. Ben & Jerry’s, a Vermont corporation and wholly-owned subsidiary of Unilever, operates its business on a three-part Mission Statement emphasizing product quality, economic reward and a commitment to the community. Ben & Jerry’s became a certified B Corp (Benefit Corporation) in 2012. The Ben & Jerry’s Foundation’s employee-led grant programs totaled $2.7MM in 2018 to support grassroots organizing for social and environmental justice around the country.